Why should you host live evangelism training? Many churches are stuck and want to grow again. The passion for evangelism has long since waned, and evangelism might be seen as the means of survival. Some are stuck in old patterns of thinking and simply need to be challenged and shown how to engage the current world. is not the same as a live and in person workshop. Hosting a workshop can serve as a catalyst to help reignite a passion for evangelism wherever God has you and your church planted. It provides you the information and practical tools that you and your church need to step into God’s calling for you. Hosting a workshop can help generate ideas that you can implement in your local context. I’ve tried to group some information for you about your potential role as an organizer. I had the privilege of bringing Chris Walker into the Churches of God to present to persons interested in Renewal. Chris’s passion for Christ and the faith was so evident. 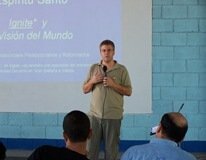 He shared very practical information with us regarding Evangelism and Hospitality. Chris is very affordable. In addition. he provided more assistance in promoting our event than any other of the dozens of speakers I have used. Chris is the same person behind the scenes as he is up in front of people. The highest compliment that I can pay to Chris is that I wouldn’t hesitate to use him again or to recommend that he be used. Thanks Chris for a great experience together. Where can you bring me? I travel and will come to your city, anywhere from Alaska to Chile. denominational conferences, and mission organizations. (See our Evangelism Training History for a history of events. If you are not sure who Chris is, check out the About Us page.). How Can you Bring me to your City? Read more at the following links.